A spacious 4-person cabin with classic Smoky Mountain décor and beautiful mountain views awaits you High-Bear-Nation. 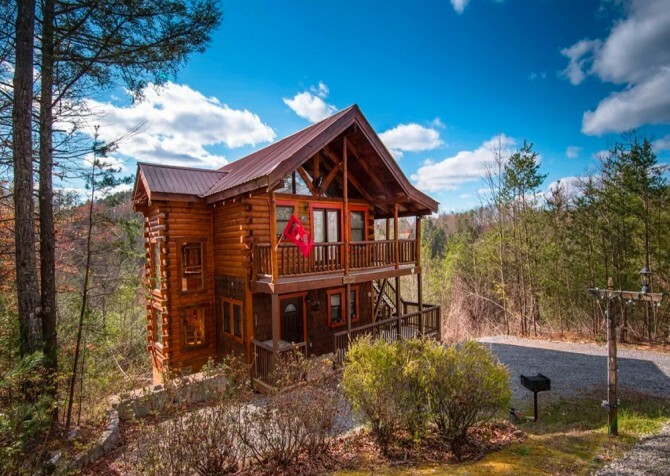 This 1,800 square foot cabin comes with 1 bedroom and 1 ½ bathrooms, providing ample accommodations for honeymooners, single families, or 2 couples vacationing together in Pigeon Forge. 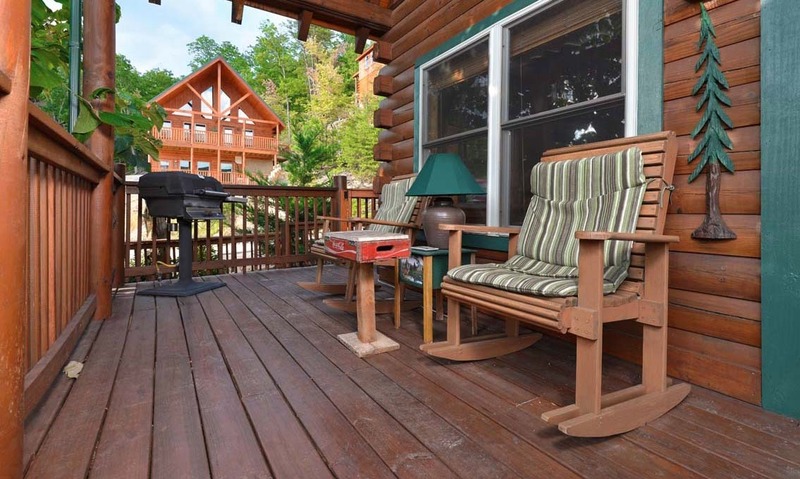 One of your favorite outdoor amenities at this cabin is sure to be its screened-in porch, where can sip your morning coffee or afternoon iced tea in complete comfort and privacy. 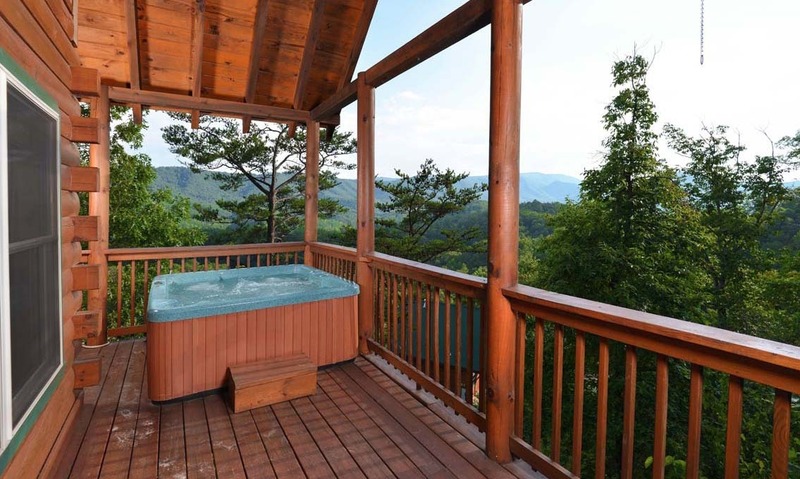 But don’t miss out on a relaxing soak in High-Bear-Nation’s outdoor hot tub, where you’ll enjoy even better views of the Smoky Mountains. 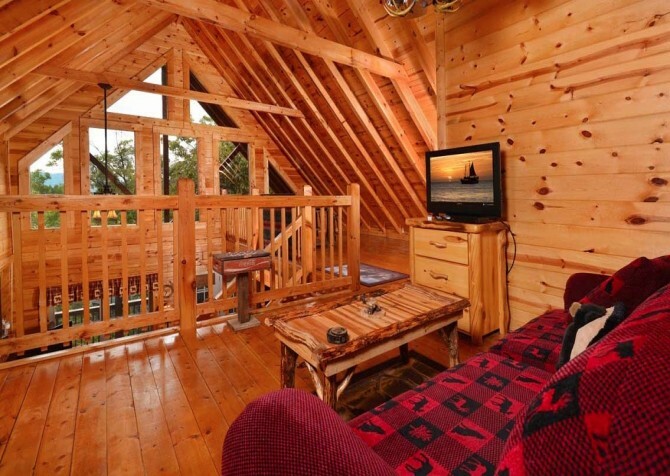 Inside the cabin, spend relaxing evenings playing in your game loft, watching a favorite movie on the big screen TV, or steaming away stress in your indoor jetted tub. This cabin provides updated amenities accented by Smoky Mountain décor for the perfect blend of modern and mountain living during your getaway to Pigeon Forge. 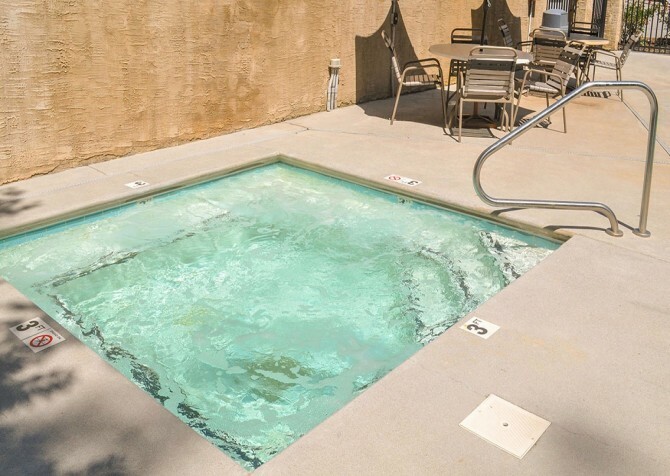 And because of its location in the Sherwood Forest community, you’ll also receive pool access! 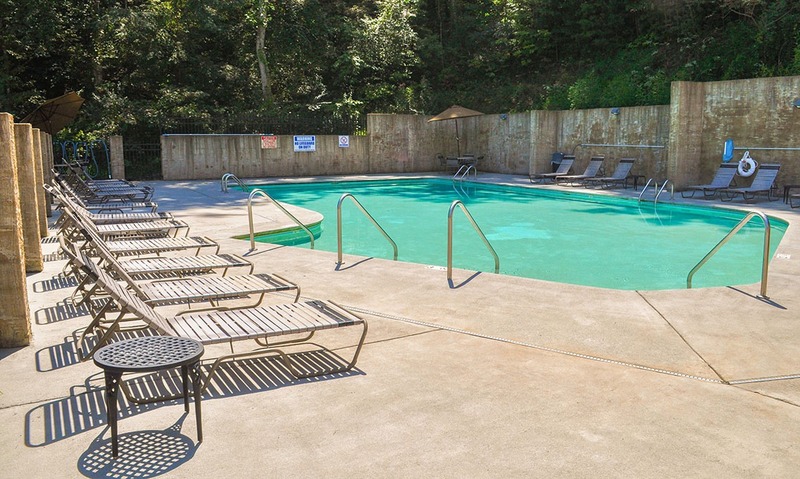 So whether you stay at the cabin, venture to the pool, or drive the short 4 miles to downtown Pigeon Forge, you’ll love your stay at High-Bear-Nation. 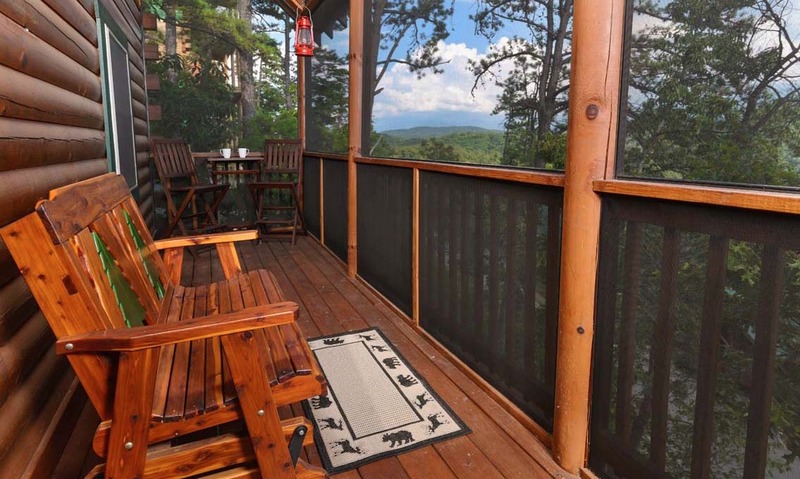 After llama trekking in the Great Smoky Mountains (yes, that’s a real thing!) or joining the fun of Pigeon Forge’s annual River Raft Regatta, you’ll want a comfy place to relax in your Pigeon Forge cabin. High-Bear-Nation’s living room is just what you’re looking for! 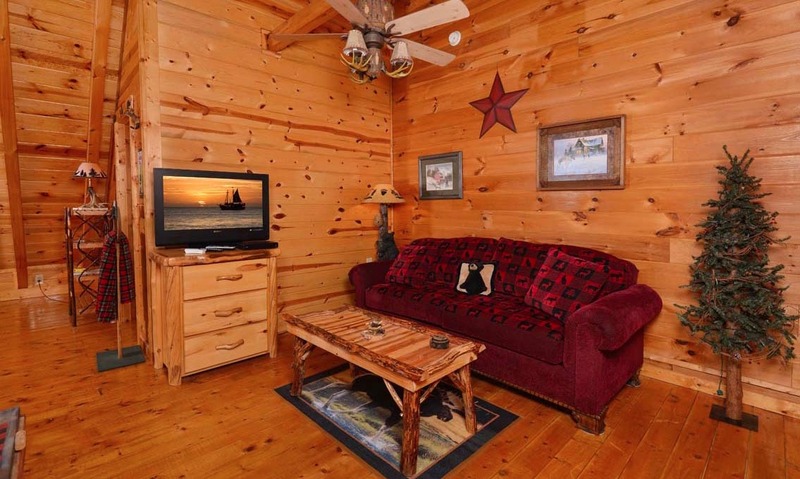 This large and inviting space features 2 matching couches—a full-size and a loveseat. Use the coffee table for a tray of your favorite snacks, and turn on the big screen TV for movie night in the cabin. 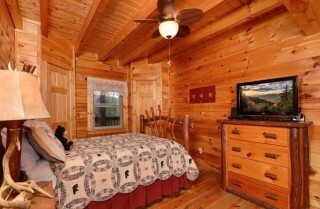 You can bring your own DVD or Blu-ray disc, or borrow one from this cabin’s provided movie library. 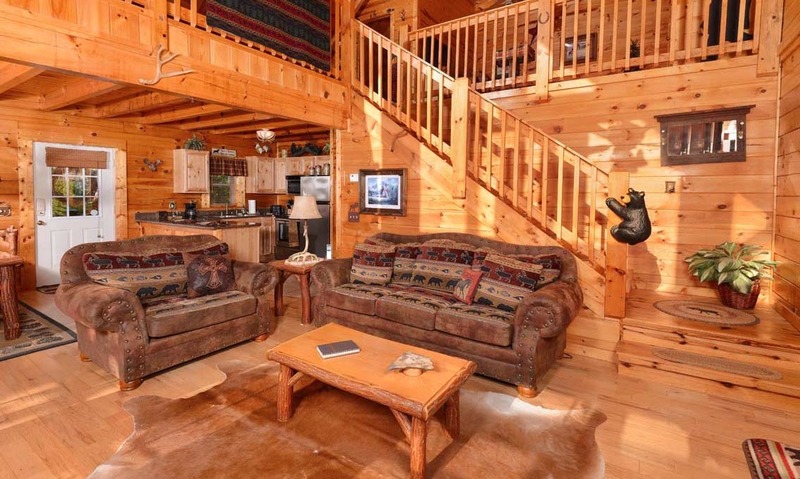 And lest you forget you’re in the Smokies, this room’s animal skin rug, log-style furniture, and black bear decorations surround you with its culture and unique style. Enjoy a quiet evening in front of the gas fireplace, or cuddle up on the couch with the one you love in High-Bear-Nation’s living room. One of the first rooms you’ll see as you enter High-Bear-Nation is this cabin’s updated kitchen. 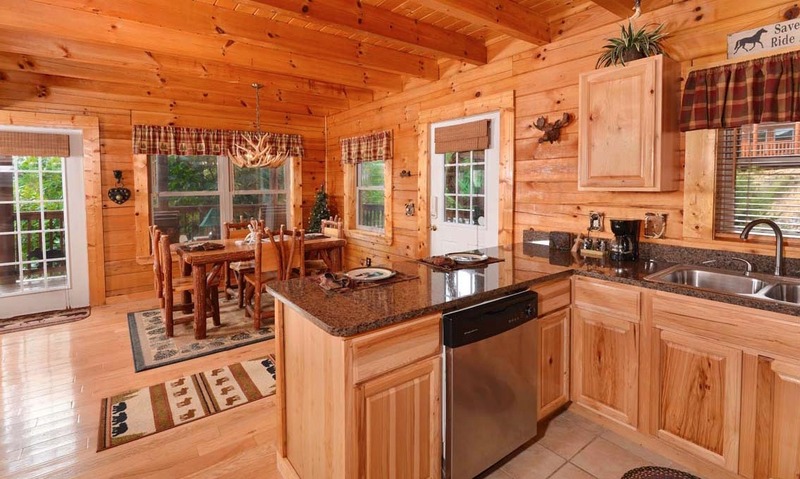 Just the right size for a 2- to 4-person getaway, this U-shaped kitchen features gray speckled granite countertops, a tile floor, honey colored cabinets, and stainless steel appliances. 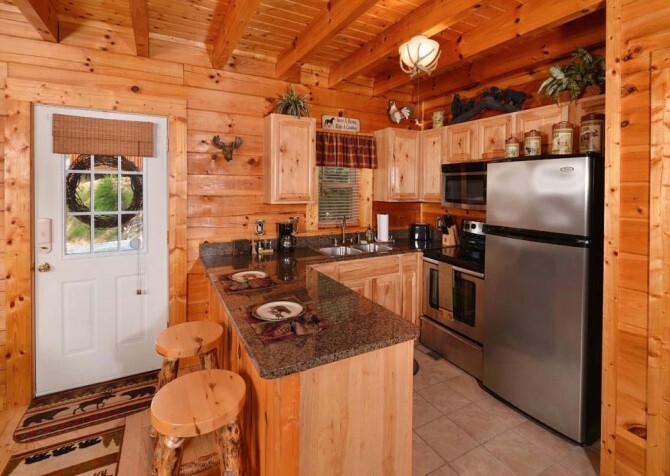 At High-Bear-Nation, you’ll have access to all the kitchen appliances you’re used to, including a dishwasher, an oven/electric stove, a full-size refrigerator, an over-the-range microwave, and countertop appliances like a coffeemaker and toaster. 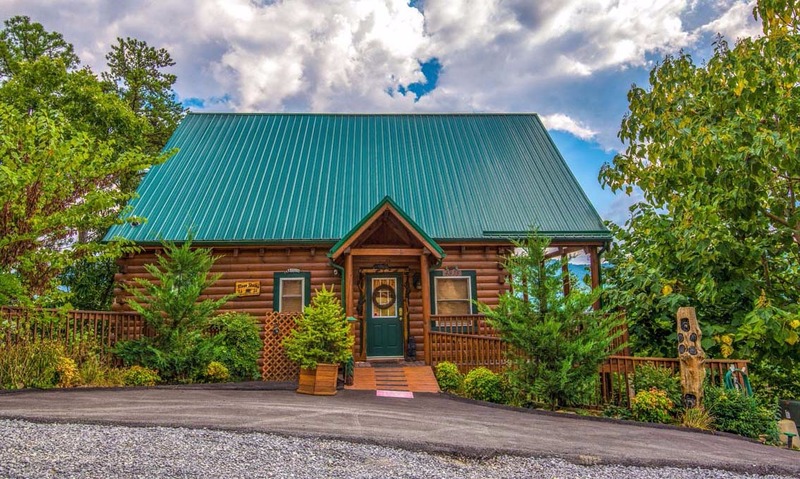 Stop by the Smoky Mountain winery before making a romantic steak dinner in the cabin, or plan a homemade meal for 4 using your family’s favorite recipes. High-Bear-Nation makes it easy to save money and spend time together while you’re in the Smokies. 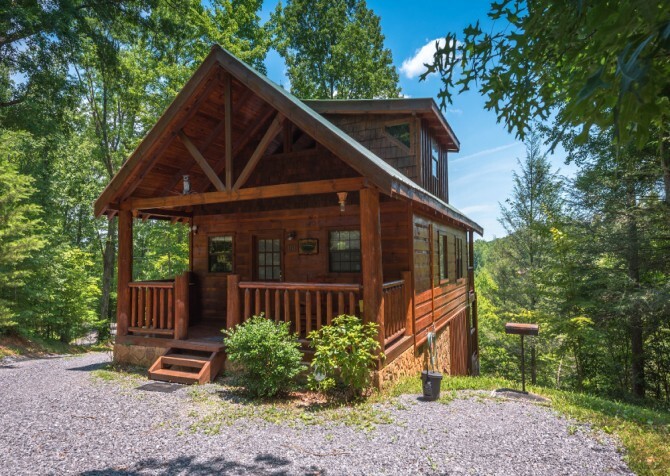 At High-Bear-Nation, you’ll know you’re in the Smokies long before you look out the window to see this cabin’s beautiful mountain views. 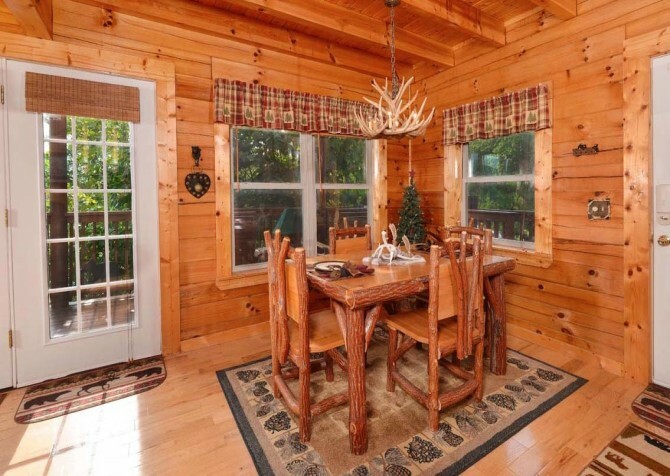 That’s because traditional Smoky Mountain décor fills every room, including the dining room with its authentic, log-style table and antler chandelier to boot! 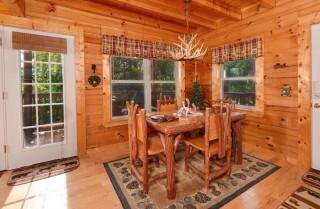 High-Bear-Nation’s dining table provides seating for 4, but if you want another option for the kids, feel free to use this cabin’s 2-person breakfast bar attached to the kitchen. 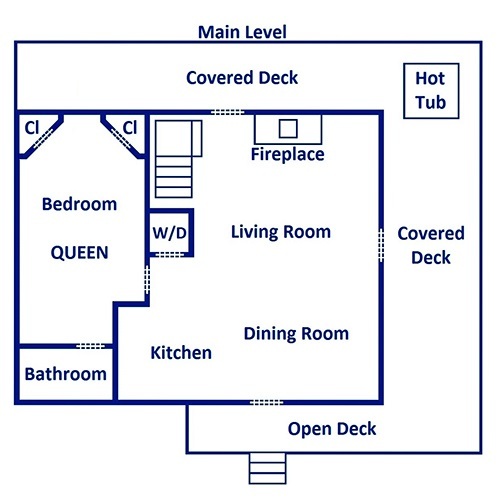 And the open-concept design of High-Bear-Nation means you can even take your plate to the living room, where you can kick back in comfort while chowing down on Mama’s meatloaf. On the top floor of High-Bear-Nation, you’ll find this cabin’s exciting loft space! This is a great alternative to driving to an arcade in downtown Pigeon Forge (though this cabin is only 4 short miles away). You’ll have access to a checkers table (which can also be used for cards or a board game) and an air hockey table also in the loft. 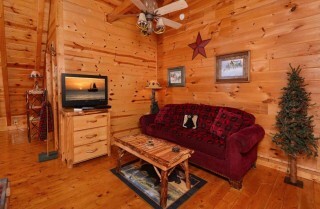 Around the corner, relax on another large couch provided by High-Bear-Nation and watch a favorite TV show to unwind. 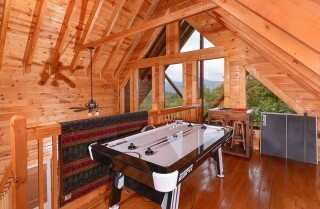 Or spread another board game on the additional coffee table. 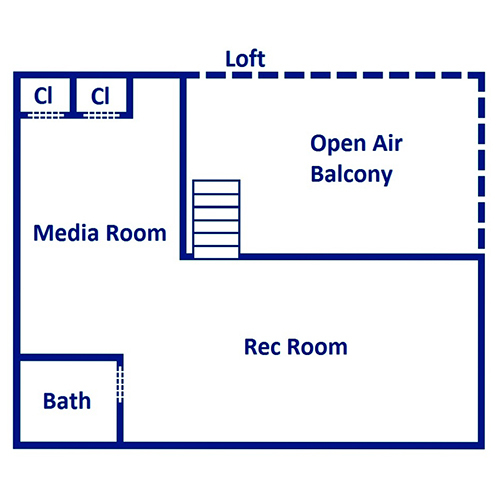 The couch in the loft doubles as a bed, so if you’re planning to bring a couple extra guests or your kids, this is where they would sleep. Total, you can comfortably sleep up to 4 guests inside High-Bear-Nation. 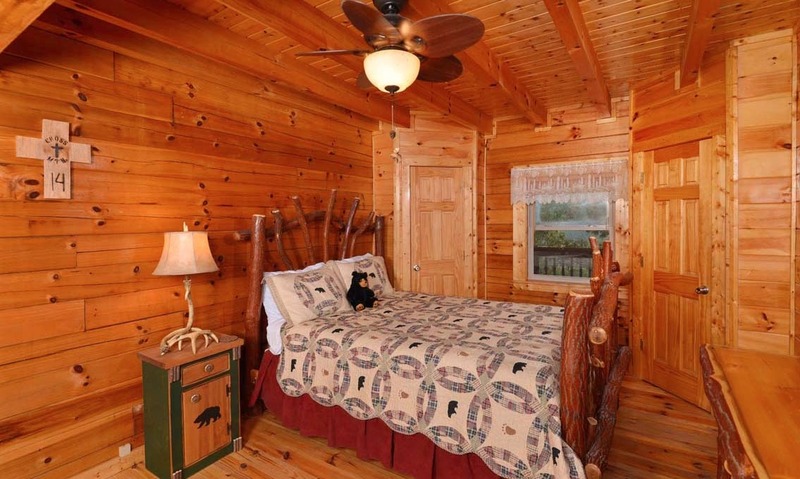 Spacious and full of character, the bedroom inside High-Bear-Nation features a queen-size comforter on a log-style frame, a coordinating log-style bureau, a ceiling fan, and black bear accents on the comforter and the nightstand. 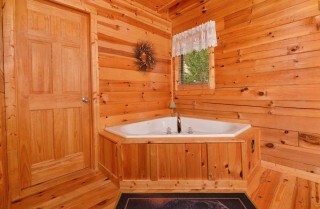 You’ll also find a reading lamp, a flatscreen TV, a small window that overlooks the mountains, and large indoor jetted tub! This bedroom is sure to be your own private sanctuary in the Smoky Mountain woods. Feel free to warm up in the tub after whitewater rafting down the Pigeon River, stay up late with a new novel before bed, and sleep in every morning—after all, this is vacation! 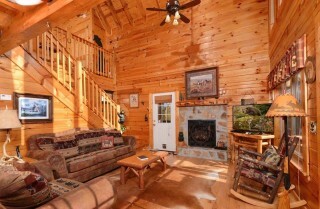 The mountain views offered by High-Bear-Nation will make your time in the great outdoors unforgettable at this cabin. 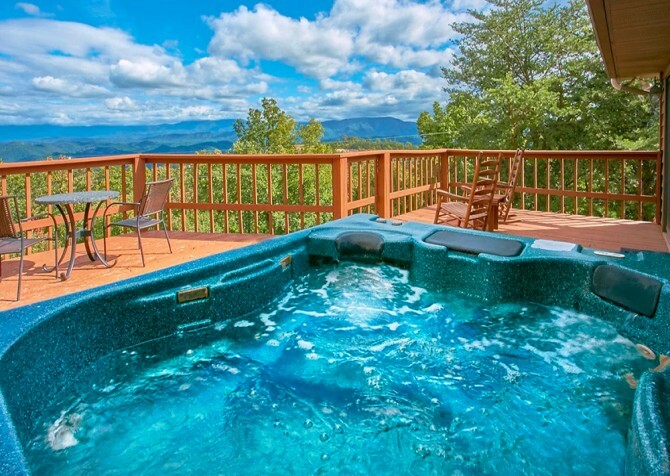 And you’ll find multiple ways to enjoy these views—like a screened-in porch with a rocking bench, a bistro-style table with 2 chairs, and an outdoor hot tub with a corner view. Even if you’re visiting in the summertime, when the trees are lush and full, you’ll be able to see the beautiful Smoky Mountains from High-Bear-Nation. So plan for relaxing afternoons on your rocking chair porch or family barbecues on the charcoal grill, and enjoy your time in the fresh mountain air at High-Bear-Nation. As part of the Sherwood Forest community, High-Bear-Nation provides community pool access to all its guests. This amenity is essential for those visiting in the late spring and summer—you’ll need a fun place where your family can beat the heat! 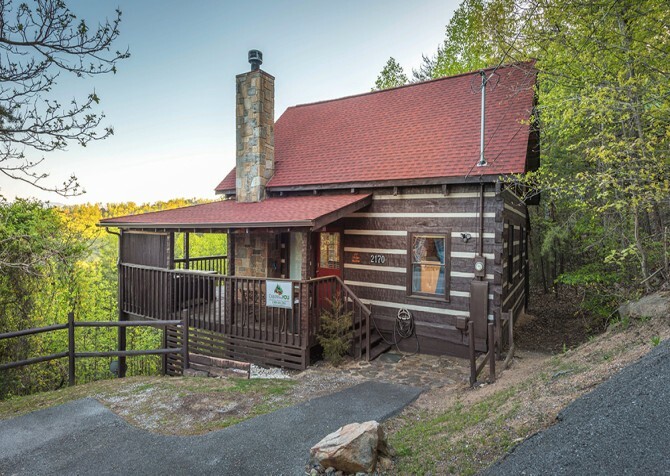 High-Bear-Nation also provides access to high speed wireless internet, which will come in handy if you’re researching road closures in the Great Smoky Mountains National Park or checking on an upcoming event in downtown Pigeon Forge. Other amenities offered by this cabin include access to a washer and dryer and a flat, paved driveway with parking for 4. Just a few miles from the cabin, you’ll find this all-you-can-eat hot and cold seafood buffet. Enjoy clam chowder, crab cakes, raw oysters, fried catfish, baked salmon, and unlimited crab legs! Looking for some down-home comfort food in the Smokies? 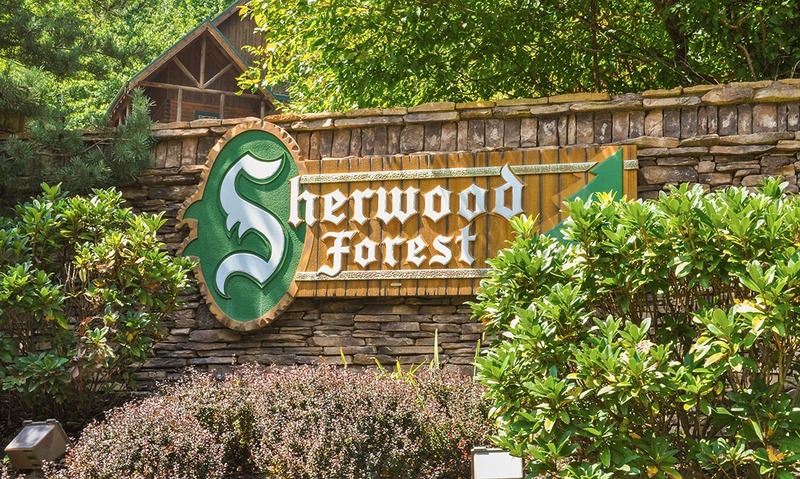 Visit Paula Deen’s restaurant at Pigeon Forge’s The Island, where the dinner menu features pot roast, meatloaf, spare ribs, and Southern-fried chicken. Pancakes are a classic treat of the Smoky Mountains, and Flapjacks is one of the best pancake houses around. Try an old-fashioned buttermilk stack or a new variety like Grandma’s Peanut Butter & Banana when you’re in town. 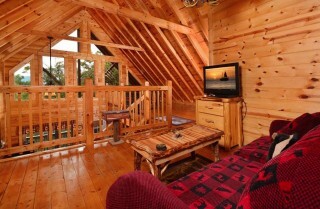 "Amazing anniversary trip! We will definitely be back! 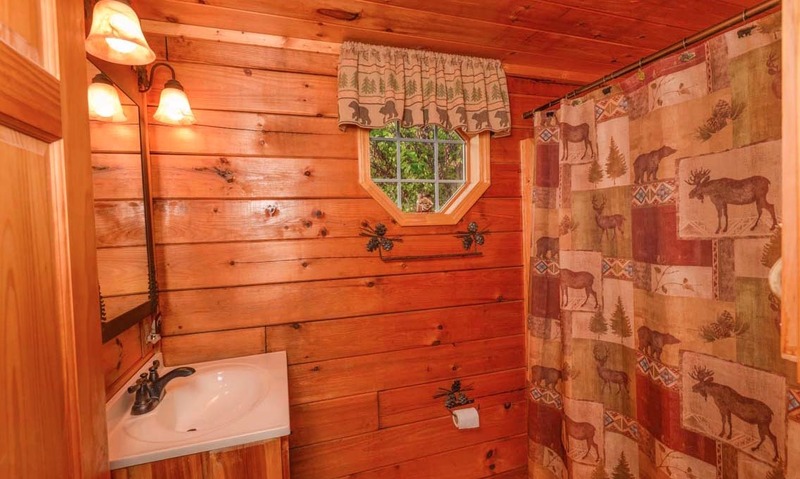 Our cabin was super clean and we loved the decor! 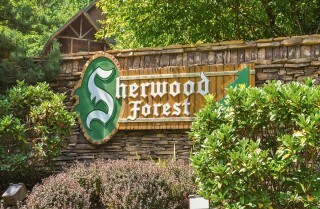 Thanks for making our time there so memorable. Cheers from Canada !"